Angelic faces in divine outfits have welcomed the fans of the Belgian national team in Sochi with fluffy cloud-shaped pillows on Tuesday night ahead of a friendly but tense football match with the Russian team that ended in a 3-3 draw. Reciprocating the warm welcome, many of the fans seemed astonished at first. Some visitors broke into an impromptu chant: “We love you Sochi, we do, oh Sochi we love you.” Others welcomed the angels with hugs and group selfies. Organized by the ‘Gentlefan’ club, the Sochi event was the latest in the string of special greetings by Russian football enthusiasts welcoming visitors to the 2017 FIFA Confederations Cup and setting the scene for the 2018 FIFA World Cup. The trend to welcome foreign fans in a cozy, home-like manner was started by Russian football fans from Rostov who played Manchester United earlier this month. 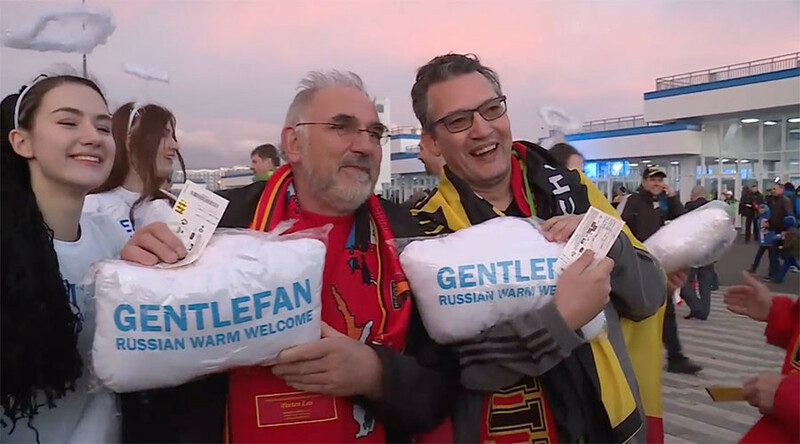 To help the Brits deal with the freezing Russian temperatures on March 9, Rostov fans were cordial enough to hand out blankets before the open-air stadium event. The warm welcome theme under the ‘Gentlefan’ hashtag was then picked up by fans from Krasnodar who last Friday hosted Russia’s friendly match against Cote d’Ivoire. A total of 150 students from all over Africa received warm blankets and 'Gentlefan' memorabilia. In the friendly match at the recently reconstructed Fisht stadium, it all looked comfortable for Belgium until their two-goal lead at halftime was canceled by Russia in stoppage time. Russia struck first when Viktor Vasin netted as early as the third minute. Kevin Mirallas equalized from the spot after Christian Benteke was brought down in the penalty area. Benteke then gave Belgium the lead with a fantastic header and the Crystal Palace striker grabbed his second of the match on the stroke of half-time, putting the Red Devils in a commanding position. The Belgium team continued to look comfortable out in Russia with a 3-1 lead before Aleksey Miranchuk converted from inside the box with 14 minutes to play. The thrilling game was sealed in stoppage time by Aleksandr Bukharov who come off the bench to grab the fateful equalizer for Russia.